It’s time to get a little nerdy about Malt. We are going to run through and compare Blacklands Malt White Horn® Pilsener to Briess® Pilsen Malt, and hopefully learn a little bit about choosing quality products. Malt Analysis sheets are useful tools in a brewery toolkit for making ingredient choices. These sheets allow the brewer to understand the consistency batch to batch, and potential issues that can also affect the end product. Specific malt types vary a bit between maltsters – and a Malt Analysis sheet can sort that out. Above is the sheet for Blacklands Malt “White Horn” Pilsener, and reading through the notes, you can see that it will be a bit more like a very malty 2-Row than continental pilseners. These sheets vary significantly between maltster and country. This will include the specific tests and metrics, as well as variations in standards (EBU vs SRM, etc.). So things might seem a little tricky at first. I will leave it to you to determine what measures are most important to your goals. However, it should be noted that Blacklands Malt is a very small local business compared to the much larger Briess, located in Wisconsin. If your LHBS cannot produce the malt analysis, you may be able to find recent sheets online at the maltster’s website, using a lot number typically printed on the malt bag (bulk) or Google search. At a minimum, you should expect to find out the “Brand” and some information on dates your shop binned the malts. 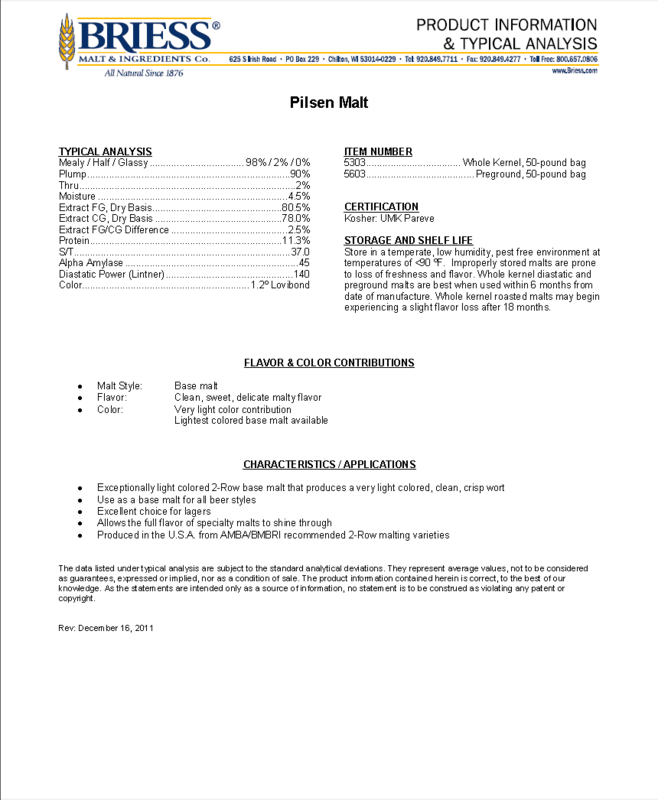 Maltsters like Briess publish annual “Typical Analysis” sheets. This should be adequate as product variations at their facility is extremely low. This should be pretty self-explanatory. This is the 6th batch produced of White Horn pilsner malt and the barley was sourced from Alamosa, Colorado. It is currently less than 2 months old – so relatively fresh. If you drop down into the notes, there is a batch specific statement that is important: “This batch had the typical grassy Pils flavor kilned away and therefor has a similar flavor profile to a malty 2-row pale malt.” The notes go onto mention “clean malty flavor” and “a green sweetness, with little grassiness, not typical of ‘normal’ Pilsener malt”. This should be taken into consideration – it might be more appropriate for traditional continental lager, but perhaps not for a light American lager. This refers to the kernel size, and White Horn is some fairly “fat” pilsener malt. This flags crush as a possible issue – meaning that I should see a better crush, and possibly a few points extra extract and efficiency. Somewhere between 90 and 95% plump is more typical for American pilsener malts – so you can see there are some points to be gained here without crushing finer. Size is determined with a series of stacked screens, and malt shaken through. You should always expect <1.0% thins. That said, you will see that standard American Pilsener from Briess is only 90% plump and 2% thins… this would indicate a resultant difference in efficiency between equal dry weights with a standardized crush width. Proteins and Nitrogen can be somewhat interchangeable. Proteins are made of nitrogen-based compounds and roughly 1% nitrogen will equal 6.25% protein (Noonan, Brewing Techniques). Protein over 12% can create lautering issues and haze problems. Mash technique and temperature, finings and lagering should solve both issues. S/T is the ratio of soluble nitrogen to total nitrogen, and an indicator of modification – here, White Horn’s 42.1 indicates infusion mashing is probably ok for a light-medium bodied beer. Brewers will immediately recognize S.G. as Specific Gravity, degrees Plato. Conversion time here is a bit concerning because we see that we have 50-55 minutes required to achieve final gravity. In the notes, there is an indication that this Pils is undermodified. That means potentially longer mash times, as well as the possible need for stepped mashing. More on this later. These are extraction values. Again to the White Horn notes: “** Extract values provided above were obtained using a single infusion HWE technique that does not demonstrate the full extract potential with a stepped mash.” CGAI means Course Ground As Is, and FGAI means Fine Ground As Is – course being more closely associated with home brewing expectations. As you can guess – we are dealing again with extract, this time as a Dry Basis. Typically Dry Basis is used to determine the maximum soluble extract. We can use the CGDB% to help estimate extraction rate in the brewery, but should modify this number based on brewery extract efficiency and determine yield or extract per pound. Noonan gives calculations for this. You can see little difference between Blacklands and Briess offerings particularly in the course grain – yet a possible efficiency difference that would likely be made up by the fatter grains of White Horn. For fine grain (hammer mills at commercial breweries), 5% is very significant. So this seems fairly straightforward as well. White Horn is very lightly color, perhaps a bit darker than continental pils. Wort pH is determined from a small batch distilled water mash – and results in a pH of 6.1, and typically provided by other maltsters. This is really good information to have, and helpful in determining water treatment necessary. I need to speak with Brandon to see if this is a room temperature pH or at temp at some arbitrary temperature. If at mash temperatures, then 6.1 is somewhat high, and will require lactic or phosphoric acid to achieve a reasonable mash pH (room temperature for us homebrewers). We may be able to infer a mash temperature of 25° C from the S.G. reading. Briess only provides color in degrees Lovibond that must be converted to SRM to compare. Malt Moisture indicates the stability of the malt over time. We would typically expect moisture contents around 1.5% to avoid mold and bacterial growth. This is also an indicator of the storage and time from kilning, and moisture content would drop over time assuming proper storage procedures, and fresh malt should be stored in dry conditions. As White Horn is a local and fresh malt, the relatively high moisture content is not an issue, unless I wanted to store for any extended period (over 6 months for example), where Briess stores in bulk in highly managed dry conditions. This number would also modify a brewer’s “Real Extract” potential. Viscosity relates to the breakdown of endosperm cellular walls during modification, and an indicator of “sticky” characteristics in a mash – the number should usually be below 1.75 cP. Above that value and decoction mashing should be considered or a regiment of step mashing. Filtration is an ASBS standard test related to viscosity that givens some indication of starch and protein conversion and lauter-ability. Briess does not provide these other bits of information. Here we are getting to the heart of conversion capability. White Horn grist will have a diastatic power of 139° Lintner, compared to 140 from Briess, providing a measured power of starch converting enzymes available. This is also a function of the relatively high protein content. This malt has an excess of enzymes to convert well more than its weight under normal mashing conditions, so adjuncts should be ok. The expression of alpha- and beta-amylase (may) provide some indication of appropriate mash regiment and indicative to the kilning schedule. Combined with the recommendation of step mashing, we see that there is more than 3:1 beta- to alpha- potential in White Horn. You will see that a rest at > 152° F should see significant conversion power. However, lower temperature protein rests will aid in lautering, and potentially assisting full conversion. Briess doesn’t provide the additional test data. 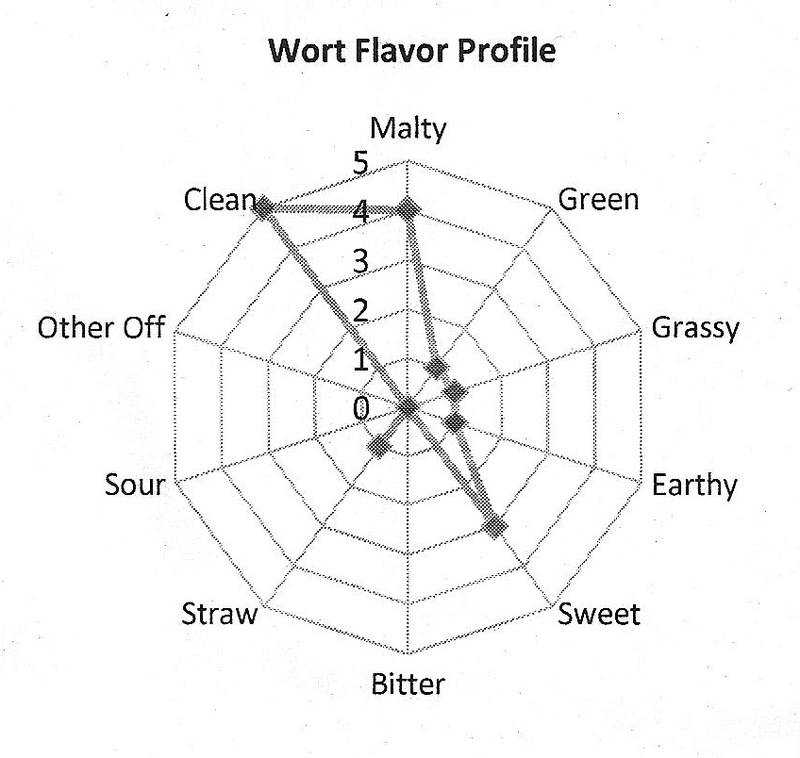 The spider chart gives a sensory evaluation of wort created from the analyzed malt. While not often deployed, it provides a quick glance of the areas and primary malt flavors characterized by the samples. If many cases, normal American Pils will have a vector that leans toward “grassy” – which is not evident here. However, malty and clean, as well as moderate sweetness make this a wonderful candidate for any lager, but particularly those that require a more robust malt character, such as Helles or Bocks. Of course, we would expect minimal off-flavors, but an honest maltster would indicate such on a batch to batch basis. This is a rare feature on malt analysis, and normally a more internal subjective test to ensure quality and consistency. Both maltsters provide significant notes that describe their products quite well. Where White Horn indicates that the grassiness expected of Pils has been kilned off – we get slightly less specific, but useful descriptions from Briess – “Clean, sweet, delicate malty flavor.” You can also find Certifications such as; “Kosher, UMK Pareve” from Briess that is missing from Blacklands. Friability: measures the ability of the malt to crumble when crushing. It is related somewhat to size and moisture content. It is also correlated with mealiness or glassiness. Mealiness (%): another indicator of crush effectiveness. Malt is often characterized as half-glassy or glassy ends or just glassy – correlated to quality of the endosperm, where starch is locked. You want “mealy” malt – at or above 95% for standard infusion mashing. Less and you need to consider decoction or step mashing techniques. DMS Precursor (DMS-P): represents apparent levels of S-methyl methionine (SMM) and dimethyl sulfoxide (DMSO) in the malt. You can tell this directly correlates to the production of DMS off flavors in beer where boiling and fermentation regimen are necessary to remove the opportunity for DMS to appear. A more modified malt should show a lower DMS-P value. Remember that for pilsner malts you should extend a boil to 90 minutes to ensure you remove SMM, and cool wort quickly to prevent SMM from forming. Hopefully this overview gives some basic insight into Malt Analysis sheets, and how they can empower a home brewer to more closely replicate a specific beer or increase consistency between batches. Blacklands Malt provides a fairly detailed and unique view of their products, where others may provide more statistical and general analysis. You can exploit this information to manage extract efficiency or optimize brewery techniques to achieve a specific flavor profile, or simply manage consistency. Ultimately, a Malt Analysis Sheet cannot and should not replace the practical hands-on approach of brewing with the product. Taste, smell and feel are very important. For the home brewer, a test mash can reveal a lot of the behavior and flavor/aroma character of a given malt. 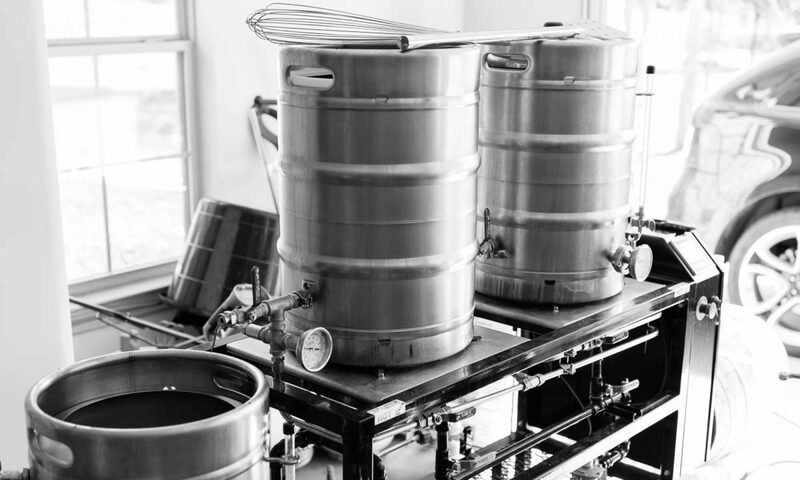 In particular, utilizing the test mash to achieve an appropriate large scale mash pH – regardless of mash regiment – should also allow you to maximize the potential of your most basic ingredient. I didn’t see any values for DMS-P on your sheets. Did they include that data?